U.S. Air Force has released details about the F-16D Thunderbird accident during Dayton Air Show 2017. 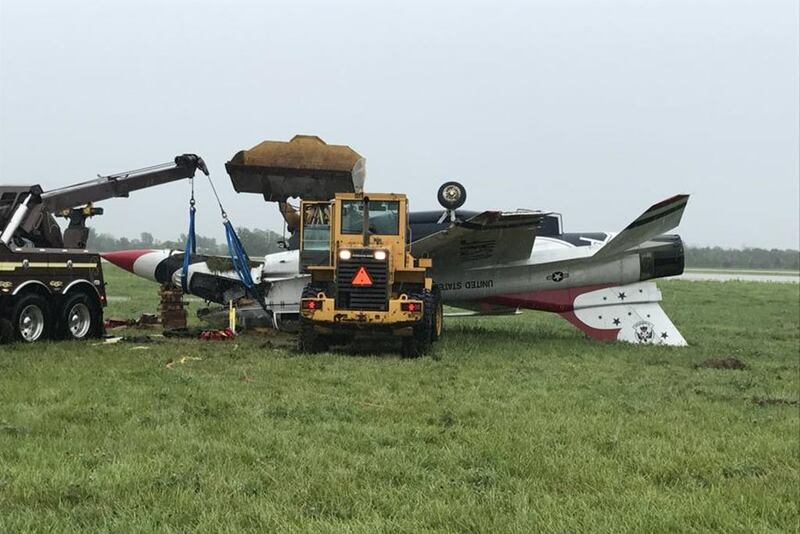 Excess airspeed and insufficient stopping distance on a wet runway resulted in an F-16D being overturned and destroyed upon landing at Dayton International Airport, Ohio, June 23, 2017, according to an Accident Investigation Board report released on Nov. 3. The pilot sustained injuries and the crewmember was uninjured. The mishap occurred after a familiarization sortie for the crewmember, during which the pilot demonstrated the capabilities of the F-16D and the maneuvers performed by the United States Air Force Air Demonstration Squadron. Upon landing, the pilot was unable to stop the aircraft on the prepared surface. As a result, the aircraft departed the runway and overturned in the grass. The accident investigation board concluded contributing factors to the accident included: environmental conditions affecting vision, misperception of changing environment, and failure to follow procedures. No other personnel were injured. The aircraft, valued at $29 million, was destroyed. There was no known damage to civilian property. At the time of the accident, the pilot was a current and qualified USAFADS pilot, with a total flight time of 1,761 hours. The crew and aircraft are assigned to the 57th Wing, Nellis Air Force Base, Nevada.